Downtown Raleigh used to be plagued with street crime and devoid of any “nightlife” whatsoever. Things have changed quite a bit the last ten years, and downtown Raleigh’s population is nearing 8,000 people. That’s fantastic for us, and for downtown. It also means that growing pains, and the conflict associated with them, are inevitable. This summer’s big controversy: Raleigh’s new outdoor seating ordinance, the most dramatic city ordinance in recent memory. I’ve got a lot of friends on both sides of this argument, and both sides have very valid points. The weekend the law went into effect, I told someone I know (a strong proponent of the law) that I liked this law. And I did: the sidewalks were easier to navigate on foot, and downtown felt a little less crowded. 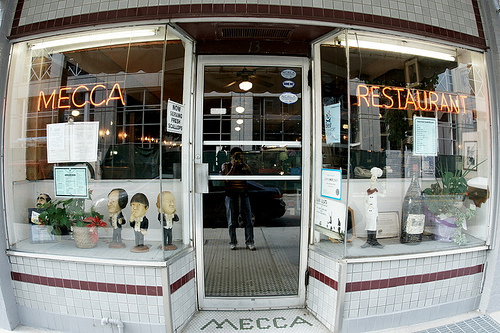 When it came time for the Mecca to apply for our seating permit, however, I realized how much this law needlessly restricts small businesses. This ordinance is well-intentioned, but it goes too far. It needs to be simplified, and stripped of restrictions that, in my mind, do nothing to improve the pedestrian environment. 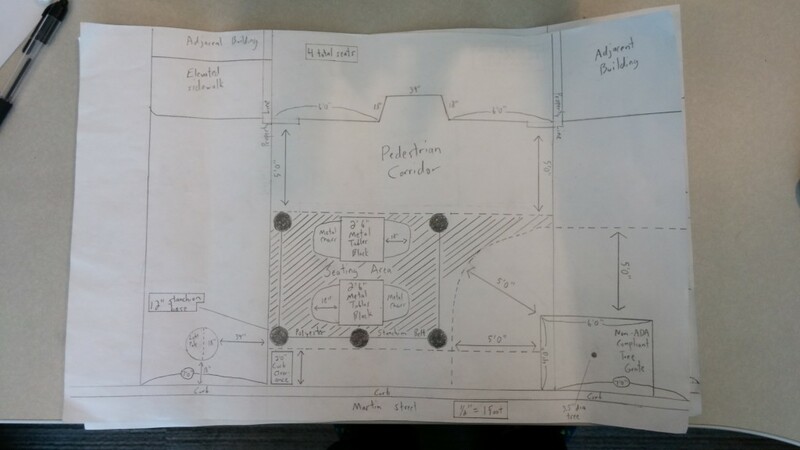 When we applied for our Outdoor Seating Permit, we were confronted with three major issues. The first of these issues is the tree grate in front of the Mecca. According to the city, our tree grate is not compliant with the Americans with Disabilities Act. Therefore, any outdoor seating must be at least 5 feet from the edge of the tree grate. If we were to have an ADA-compliant tree grate in front of our business, we would be able to measure that 5 feet from the trunk of the tree. When you have a small store front like we do, that distinction is huge. We tried asking the city to replace the tree grate, and were told that we would have to pick up the tab for any replacement, at a cost of $1500. Unfortunately for us, this regulation has eliminated a quarter of our available space. Our next issue was the pedestrian corridor. 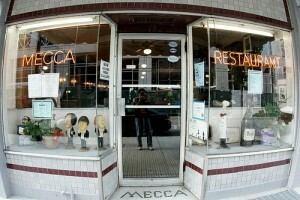 If we choose to have seating directly against the Mecca (as was our plan), we are required to set aside an unobstructed pedestrian corridor at least 5 feet in width starting at our front door. Our entrance flares out to four feet and is, thus, not wide enough, meaning that we have to cut out six inches off each side when measuring the available seating space against the building. Since our building is 16 feet wide, and the door is 4 feet wide, we are left with 5 1/2 feet on either side of the front door for outdoor seating. Or about 6 inches less than we’d need to fit our existing tables and chairs against the building. That issue eliminated another third of our available space. The final issue is the part of the law that stipulates that any street side tables must have no more than two seats. It makes sense that the city does not want to have customers sitting against the street with their back to it. That scenario would be frustrating for people parking in front of that business and for the customer who’s unfortunate enough to be sitting there. But why the ban on having a third chair FACING the street? 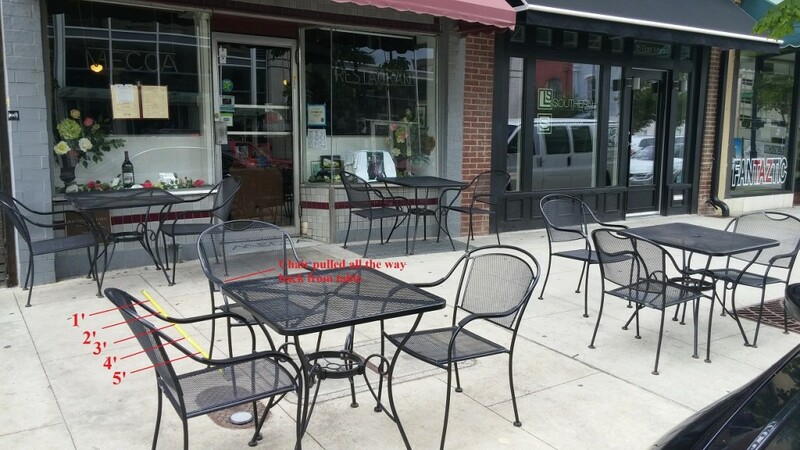 If a restaurant has enough room, and leaves the 2 feet of curb clearance the law requires, who would be adversely affected by a third chair, as long as there is still a five foot corridor for pedestrians? If the city is responsible for maintaining tree grates, why is the playing field not even? Why are some restaurants lucky enough to have a tree grate that is ADA-compliant, and others not? And where did this 5 foot-from-the-grate rule come from? If our customers currently have no use for an imaginary 5 foot pedestrian corridor as they leave the building, why is our lack of said corridor allowed to be a hindrance to having seats by our front windows? If we can fit a three top at a curbside table and still leave 2 feet of curb clearance and 5 feet of pedestrian clearance, why are we being forced to take that third chair inside? As you can see, there is clearly enough room through which pedestrians can pass, even with the third street-side chairs pulled all the way out. In our initial proposal, it is plain to see that people would have plenty of room to leave the building. Plus our property line ends exactly halfway through the layers of unpainted exposed brick, giving us the ability to push those tables out another foot or so, if needed. You will also notice that the tree grate, in the far fight corner, barely touches our property. The only way a customer would ever physically cross over that grate would be if they sat in the one chair that abuts the grate. A reasonable solution would be to not have that third chair by the grate. As the law stands right now, however, this is not going to be the case. Limiting that table to a two-top is not good enough; we’ll have to have no table at all. So, at the end of the day, we are left with the four-seat solution we submitted below. All of which leaves us with room for four chairs in front of our business, and a lot of empty sidewalk. Does the ordinance needs to be done away with altogether? No. But it does need to be simplified. The Council is scheduled to look at this ordinance again on November 3. It is our hope they they look at it objectively, from the perspectives of both the pedestrians and the small businesses that inhabit downtown Raleigh. The people who wrote this law, and support this law, are good people. These people want what is best for our city, and for that, they deserve our respect. We look forward to a debate that we hope will be healthy and respectful.